Today, March 8th, women around the world are being celebrated on International Women?s Day. Events are being held all around the world with over 400 events in the U.S. and Canada, as well as over 400 events in the United Kingdom. Whether you decide to take the day off from work for a well-deserved mani-pedi, indulge in a box of decadent chocolates, or go to the movies, one thing is for sure– take a moment to honor your accomplishments, hug your friends, and remember your loved ones and girlfriends. To stay inspired for the day at Cyber-Dating Expert Headquarters, we?ve selected our 7 favorite inspirational quotes from women we admire. Let us know which ones are your favorites and feel free to add a few of your own. Wishing the women throughout the world a very Happy International Women’s Day. Give yourself a hug. What a night of joy, love and inspiration. This past Thursday, I met author and motivational speaker, Marianne Williamson.? Seventeen years ago, ?I purchased her book, A Return to Love, and since that time have read it at least five times. To this day, this book remains one of my personal favorites in my home library. Both the author, and her book have changed my life in a powerful way and have allowed me to share these experiences to help others find love in their lives. Of course I was meant to meet Marianne Williamson. Why it took 17 years, I am not sure as we have mutual friends and business acquaintances in common. ?Perhaps I wasn’t ready yet, but when I received an invitation from my friend, Gina Ratliffe to meet Marianne, I jumped at the chance.? Her teachings have had a profound affect on my life. After her powerful talk, I had the opportunity talk with her personally and thanked her. ?We embraced each other with a loving hug, and she listened as I told her just how much she has meant to me over the years. It was our moment together of authenticity and pure love. The process from her book, teachings, and her interpretation of The Course in Miracles is simple. You get scared, you go into fear mode. To get out of fear mode, you return to love mode. The opposite of love isn’t hate?it’s fear. It’s simple, practical, ?spiritual, and we all need to be reminded of it on a regular basis. This goes for love relationships, work relationships, and friendships. and practice these simple and powerful techniques. You’ll be surprised at the amount of joy you will receive in return. Isn’t it time you followed your dreams and started getting paid for your expert advice? Have you thought of reinventing yourself and you didn’t know how to get started? If you answered yes to any of these questions, read on. 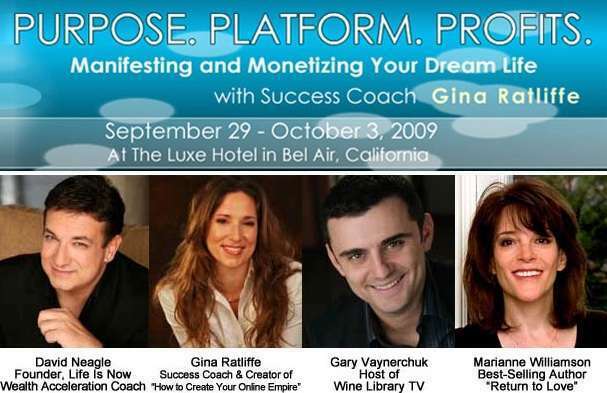 Join me on September on September 29 – October 3, 2009 for an exciting 5-day conference in Los Angeles, called Purpose. Platform. Profits: Manifesting and Monetizing Your Dream Life! Gary Vaynerchuck, host of Wine Library TV. Gary just received a 7 figure book advance from HarperCollins. David Neagle, wealth acceleration coach and founder of Life is Now. I will be at Purpose, Platform, Profits at the Cyber-Dating Expert table, where you will find me giving dating advice and introducing singles to my “Coaching with Julie” program to attract the man of your dreams. Sign up now, as this will be a limited seating event and Gina is offering a special “attend with a friend” promotion for those who sign up by September 22nd. I can’t tell you how excited I am about this. I have had enormous opportunities and huge success as a result of building my platform. With these experts, I know that I will be taking my dream of helping other singles to a new level. TO LEARN MORE ABOUT THE EVENT, REGISTER FOR TWO SNEAK PREVIEW CALLS! There are 2 calls left for you to join in and learn more about this amazing program. Thursday September 10th — Platform. How your platform = $$$ for you! Thursday September 24th — Profits. I don’t usually take five days out of my busy schedule, but this was too good to pass up. I look forward to meeting you at this event. If you are curious to hear more, please register for the calls, or click here to sign up for the conference.